Now here’s a CD you can treasure forever and play over and over again. And you don’t have to be a romantic or even a lover of the cello and guitar. 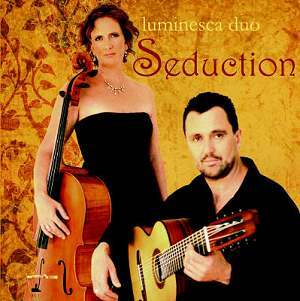 Separately they are instruments of great individuality; together they spin a web of intrigue, rhythm, languor, mystique and, as the title of this CD pre-supposes, seduction. Trish O’Brien and Gareth Koch are both superb Australian musicians who enjoy making music together. O’Brien was born in Tasmania and with grit and determination became principal cello at the Sydney Symphony Orchestra. Complications arising from the neglect of an injury to her wrist left her, according to experts, with no hope of ever playing the cello again until years, and two children, later when she fell and fractured the same wrist. Since then she has gone through rehabilitation, anxiety and constant reminders of the injury to forge a living as a solo artist and as a member of various ensembles. Following years of intense study, including a stint in Vienna, he has developed into a remarkable guitar virtuoso. He also plays with various groups. The latest, called ‘Saffire’ consists of Antony Field, Slava Grigoryan and Karin Schaupp. Their debut album for ABC Classics soared to number one on the Australian Classical Music Charts and in November 2003 won the ARIA Award for best classical album. Gareth is also famous for his solo albums especially his guitar arrangements of Carl Orff’s Carmina Burana and Stravinsky’s Rite of Spring. This current collaboration with Trish O’Brien is a triumph of creativity and talent. The CD has music from the Renaissance and Baroque periods (Kapsberger, Mudarra, Caccini), from the French impressionists (Satie, Debussy, Ravel) and from contemporary composers (Houghton, di Marino, Pärt, Kitson, Lennon, McCartney). Tchaikovsky, de Falla and Piazzolla are also represented. The guitar is used mostly as a rhythm section playing arpeggios and chord progressions while the cello plays the melody line and, in some instances, just adds to the mood of the piece. There are some choices that don’t quite work, however. For example Debussy’s Beau Soir would have been more effective if played on the violin – the cello’s deeper resonance spoils the lyricism of the piece, while the guitar is far too dominant in Kapsberger’s - part of the composition is attributed to O’Brien herself - Toccata Arpegiatta. Kitson’s Amen - sorry I couldn’t find her birth particulars although I know she’s a current pop singer/composer - is a weird combination of placidity and sudden inexplicable bursts of prestissimo. Too distracting. But the rest comes up trumps. Arvo Pärt’s minimalism with its ebbs and flows is just the thing for setting the right mood and all eight minutes of it is conducive to relaxation amid the magic of the guitar almost playing solo but with the slightest hint of the cello in the background. Di Marino’s Milonga and Houghton’s Adoration has the cello at its emotive and soulful best. Truly enjoyable and recommended to all and sundry. Light a few candles, turn off the TV, dim the lights, send the kids to bed and enjoy it with a glass of wine, single malt and/or someone you love.